This is the review that will finally usher in the demise of the long-running scam called Pregnancy Miracle by the alleged Lisa Olson. Don’t be in a hurry to read this review, as it contains shocking facts and evidence proving that we are dealing with a despicable product from a wicked scammer, who is also behind Yeast Infection No More, a scam I exposed last week on this blog. Created in 2008, Pregnancy Miracle claims to have the ‘sure-fire, 100% guaranteed, clinically researched system that is backed by 65,000+ hours of alternative medicine expertise with holistic and Chinese medicine research for getting pregnant quickly and naturally.’ According to the author Lisa Olson, not only will her book cause you to get pregnant in 2 months, but it will simultaneously cure the infertility affecting both you and your husband. But as you will soon discover, this book essentially contains worthless information and will never help you get pregnant or cure your infertility or what else have you in the list above. So lets dig in. Why do I call Pregnancy Miracle a scam? If you cannot verify that the owner of a health product is a real person who is really who he claims he is, then better stay away from that health product because it is most likely a scam or worse, a dangerous scam! 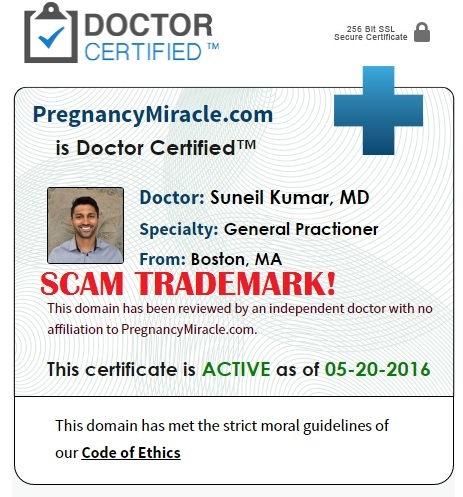 Whoever created Pregnancy Miracle is an identity thief because he is using the hijacked profile of Dr Suneil Kumar – an Indian-born general practitioner and online freelancer – to add a doctor’s touch to his scam product! Kumar’s hijacked profile has been used to endorse scams like The 3 Week Diet, ED Miracle, Red Smoothie Detox Factor and Yeast Infection No More. The fake endorsement is of course provided by Doctor-Certified.com, a shady website with a supposed ‘board of doctors’ that I’ll soon expose on Contra Health Scam! WARNING: Stay away from any website with ‘Doctor Certified’ logo floating on it! As noted earlier in this review, the owner of Pregnancy Miracle also created Yeast Infection No More, a scam I previously exposed. Now how do I know this, you may ask. Well compare Pregnancy Miracle’s website with Yeast Infection No More’s and you’ll see that it has the same webpage design and the same video presentation style. They also have similar claims, the most notable ones being that the video ‘will not be online for long’ (Pregnancy Miracle is 8-years old now) and that the product caters for both men and women (a big, fat lie because from the look of things, it is clear that the scammer is targeting desperate women, which is very disheartening). Finally, the so called pregnancy wonder book by Lisa Olson is full of useless information that will get you nowhere near getting pregnant or curing your infertility. All you will receive is a 130+ page book discussing general stuff about Chinese medicine and useless info about fertility-enhancing vitamins. For more details, watch this video by certified acupuncture and Chinese medicine specialist Charlene Lincoln – who actually bought and read the book … and is now telling you to stay away from it! As an acupuncturist who treats fertility I like to review all the fertility books I can find to help my clients. I came across pregnancy miracle aka pregnalarex miracle and the sales page hooked me. What I found was a horrendously written ebook that is filled with a lot of information that is essentially useless to a couple who is trying to conceive. Lisa Olsen the author does not exist and the testimonials are not real. Yes the book extensively talks about the benefits of Chinese medicine but the information given is not helpful. Final Conclusion: DON’T Buy Pregnancy Miracle. It is A Scam! Ignore the pop-up preventing you from leaving the website as you attempt to leave the page. Don’t waste your money and time on this product because by now, it is pretty clear that it is a useless piece of junk with a great name. Infertility is a well-known, devastating condition, but there are thousands of proven approaches to treatment you can explore depending on your case. However, you must follow your doctor’s recommendation for them to work … and don’t forget that God has the final say. So that’s it for Pregnancy Miracle review. Final verdict: scam. Please share this review to the relevant people so that they too will be informed. It will also accelerate the death of Pregnancy Miracle, thereby putting the scammer behind it out of business. Thank you! Thank you for uncovering this scam. You are right about this woman going after desperately infertile women. It’s disgraceful and a shame.